Good morning! 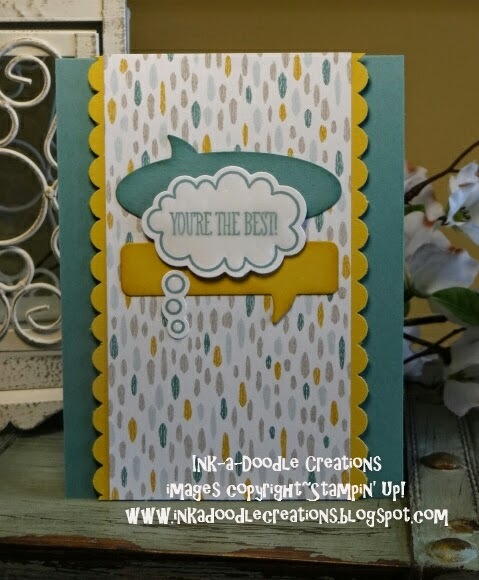 Today is stamp set focus over at Stylin' Stampin' INKspiration and we are sharing things made and created with "Just Sayin". Don't forget to come check out what the other designers created with it! I always like having Think you/thinking of you/you're awesome cards handy, cause you just never know when you need to send one to a friend or two!!! This set is perfect for that with the cute speech bubble that says, "You're the Best"! I paired it with the sweet dreams DSP pack and some simple cut out solid colored speech bubbles to go behind it as a background! I filled in the speech bubble with some crystal affects to give it a 3-d bubble affect!!! I hope you have enjoyed my stamp set focus card for this week. Leave some "love" and make sure you head on over to see what the other designers created!